I did run into Buddha several times today, and he wasn’t wearing a red shirt. Instead, he was decadently adorned with gold leaf or carved from green jasper. Buddha must’ve been a fancy guy. I began my leisurely search for Buddha by taking a boat ride up the Chao Phraya river to the Grand Palace, which is an extraordinary compound that was built in the 18th century during the reign of King Rama I. Some of the buildings within are white-walled and roofed with colored clay tiles, while others are beautifully adorned with intricate designs and gold leaf. The Grand Palace is the home of the “Emerald Buddha,” which is actually carved from green jasper and clothed in some elaborate costume befitting the season. After the Palace, I wandered over to Wat Po, which is the largest and oldest Buddhist temple in the city (b. 17th century). 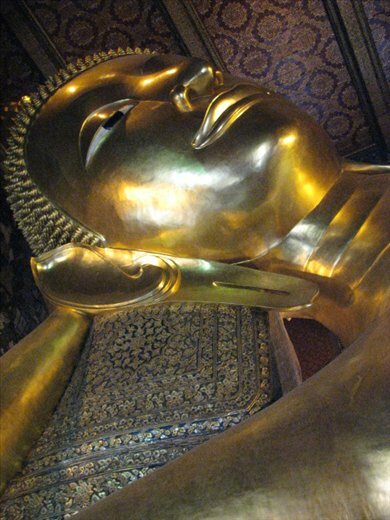 It is also home to the Reclining Buddha, a massive gold-leaf statue that is over 150 ft long and 50 ft high. When I entered Wat Po, I followed a group of students through a doorway and was surprised to see no one selling tickets. I thought to myself, “Wow, a tourist attraction where they don’t sell tickets? That’s a rarity.” I wandered inside of the compound for a little while before I got to the building that encloses the Reclining Buddha and that’s when I realized that I must’ve entered through a back way because lo and behold, there was the official entrance (with ticket booth) right there. Oops. Bad Karma. Then, of course, there are the headlines that scream out at you from every newspaper. One headline declares “Government Warns of Tough Action” as the Prime Minister vows to take decisive action to prevent demonstrators from wreaking more havoc in other parts of the city. Another indicates that tourism is down by 30 percent since the protests began and the government is feeling desperate to get this situation under control. Yet another headline ominously says that security forces are now authorized to use live rounds (not just tear gas) if they feel threatened by a protester. I don’t know enough about this situation to be a fair judge, but the collective headlines make me fear that things will get worse before it gets better. This isn’t the first bloody protest in Thailand’s modern history…and it isn’t over yet. Today’s paper showed a picture of a monk who jumped into the ruckus to join forces with the protesters. He was in his traditional saffron robe and fiercely wielding a sharpened bamboo stick. I suppose everyone searches for Buddha in their own way.